Astrea CaseMerge is a free Salesforce Lightning Component which merges duplicate Cases according to the dynamically selected multi-criteria. This component merges the duplicate child Cases to the master/parent Case along with their associated Emails, Attachments and Comments. To download this component go to this link. Salesforce does not provide any standard functionality to check and manage duplicate Cases. 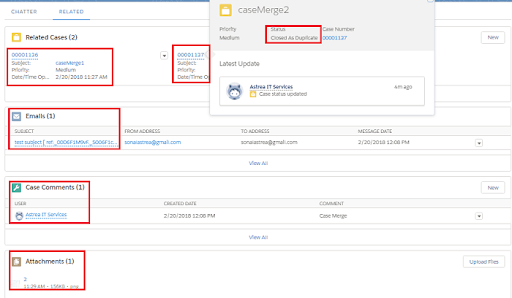 There was no standard way to merge duplicate child Cases and their associated lists into the parent Case having same Email threads coming from same customer. Astrea provided a solution for this by developing Astrea CaseMerge Lightning Component. 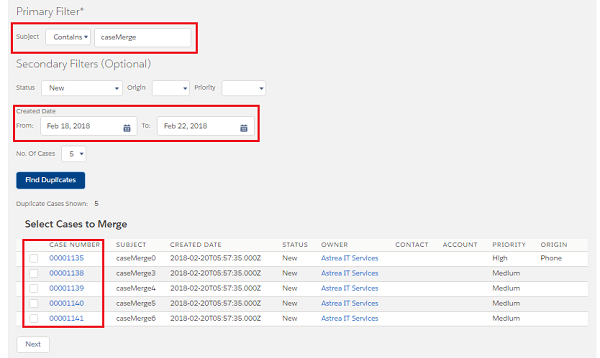 Now, the customer can merge the Cases from same customers with different criteria (Subject, Status, Origin, Priority, and CreatedDate where Subject is the primary criterion) using our lightning component. 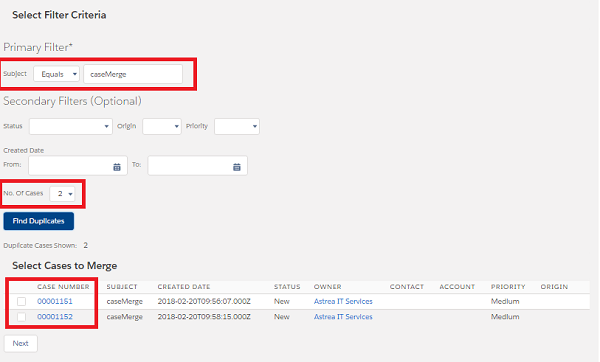 The component changes the status of the merged Cases to Closed/Closed As Duplicate, depending on the values present in the Status field of the Case object. 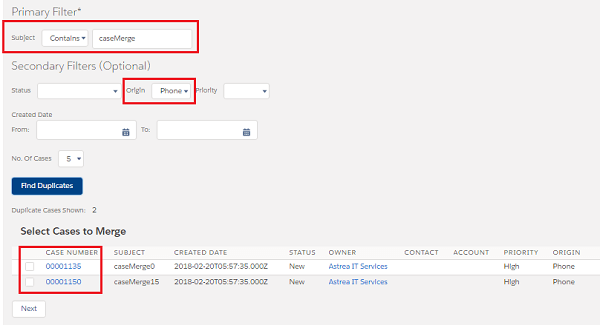 The component provides two search options Equals and Contains in case of Subject criteria. It also provides a drop down picklist to select number of Cases to be searched. Duplicate Cases with selected criteria are displayed after clicking Find Duplicate button. 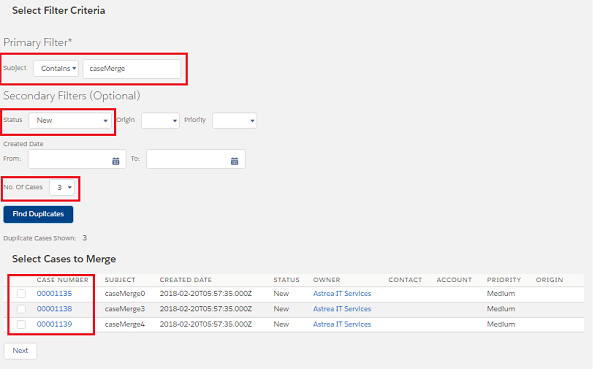 List of Cases which the User wants to merge can be selected by clicking on checkboxes. By default, the oldest Case is considered as Master/Parent Case which can be changed according to the need. The child Cases along with their associated Email, Attachments and Comments are merged into the parent Case after clicking on Merge button. 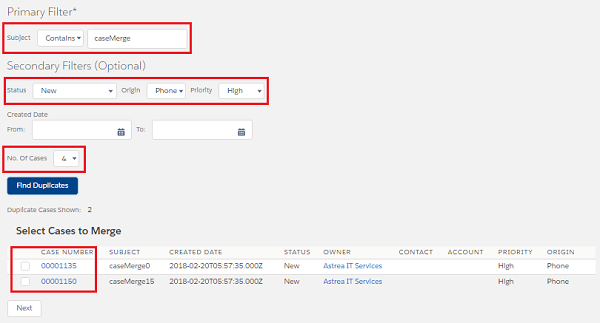 Scenario 6: We can also add Astrea CaseMerge component on the detail page of the Case or in Lightning Service Console through Lightning App Builder. 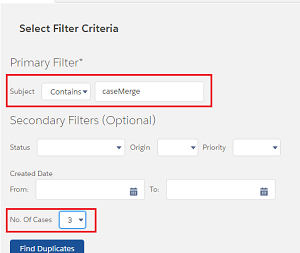 Salesforce Administrators are now able to easily distinguish between original and duplicate Cases and merge them. The Cases belonging to similar Email threads can be easily placed together. This also helps in reducing the Customer’s manual work of closing duplicate Cases. For more details on installation refer to this link.